President Donald Trump, seen with Canada's Prime Minister Justin Trudeau during the G7 Summit in Quebec on June 8. TORONTO -- Donald Trump's heightened attacks on Canadian Prime Minister Justin Trudeau are raising concerns that he might follow through on threats to impose auto tariffs, a move that could devastate the car industry in Canada and lead to higher U.S. prices. The Trump administration's pledge to consider tariffs on all imported vehicles took on more urgency last weekend after Trump and his advisers accused Trudeau of "bad faith diplomacy" for his trade comments following a meeting of Group of Seven leaders in Quebec. "I have instructed our U.S. Reps not to endorse the Communique as we look at Tariffs on automobiles flooding the U.S. Market!" Trump tweeted Saturday evening while en route to Singapore aboard Air Force One. "Very dishonest & weak," he said of Trudeau. Trump has asked the Commerce Department to review whether vehicle imports threaten national security, which would add to levies already imposed on steel and aluminum. The car tariffs could apply to all countries, including Nafta partners Mexico and Canada, the two biggest exporters of autos to the U.S.
"I think we are all sitting with bated breath hoping that cooler heads prevail, but most of us believe there's an equal chance that they won't," said Dennis DesRosiers, president of DesRosiers Automotive Consultants Inc. in Richmond Hill, Ontario. The tariffs would have to clear several hurdles before being implemented, including fierce opposition from the industry and Republican lawmakers who tend to favor fewer and lower taxes. Yet after White House trade adviser Peter Navarro said there's a "special place in hell" for foreign leaders like Trudeau who engage in bad faith with Trump, Canada's auto sector may be more at risk. Motor vehicles and parts were Canada's biggest export after energy products, representing about 16 per cent of the C$7.4 billion ($5.7 billion) in shipments over the first four months of this year. The Canadian auto industry directly employs about 130,000 people and contributes more than C$20 billion annually to gross domestic product, according to the Canadian Vehicles Manufacturers' Association, which represents the Canadian arms of General Motors, Ford Motor Co. and Fiat Chrysler Automobiles. If the tariffs are implemented, they would shave about 0.6 per cent off Canadian economic growth, estimated Brett House, deputy chief economist at Bank of Nova Scotia. With the economy growing at about 2.2 per cent, that's lopping off more than a quarter of growth, he said. "There's no question it would be felt." Five automakers -- GM, Ford, FCA, Toyota Motor Corp. and Honda Motor Co. -- produced about 2.2 million vehicles in Canada last year. Approximately 85 per cent of those vehicles are exported, with the vast majority going to the U.S. The most popular models shipped to the U.S. include the Toyota RAV4 and the Honda Civic, both assembled in Ontario plants. If the U.S. imposes a 25 per cent tariff on those exports, suddenly they don't make much economic sense, said Kristin Dziczek, vice president of industry, labour and economics at the Center for Automotive Research in Ann Arbor, Mich.
"It's not an economically feasible prospect to import vehicles to the U.S. market in a 25 per cent tariff situation," she said. "It would be very difficult to sustain a Canadian industry without relatively free access to the U.S. market." The tariffs threaten an ever-shrinking sector in Canada that lost 53,000 jobs between 2001 and 2014. Canada's loss has been Mexico's gain, as production there has soared thanks to Nafta and other trade deals. In 2008, Mexico surpassed Canada for the first time to become the second-largest North American producer of light vehicles, according to the Center for Automotive Research. While total Canadian production may decline by 135,000 units between 2016 and 2020, Mexico's are forecast to rise by 850,000. The threat of tariffs add to the uncertainty in the industry, which faces a potential trade overhaul as a result of Nafta negotiations. Most analysts agree that the tariffs would also be bad for the U.S. American consumers would have to pay US$5,000 to US$7,000 more for their vehicles on average, potentially reducing U.S. auto sales by 4 million to 5 million units a year, said DesRosiers, who called it "a nightmare scenario." "It would potentially bring down the entire economy and push it into a recession," he said. Jeff Schuster from LMC Automotive estimates the impact would be less severe, cutting new light-vehicle sales by about 1 million. Trump's statements could be merely "chest thumping," he said, but after moving to impose tariffs on steel and aluminum on the basis of national security, the threat of new taxes must be taken seriously. "The escalation is starting to happen," Schuster said. 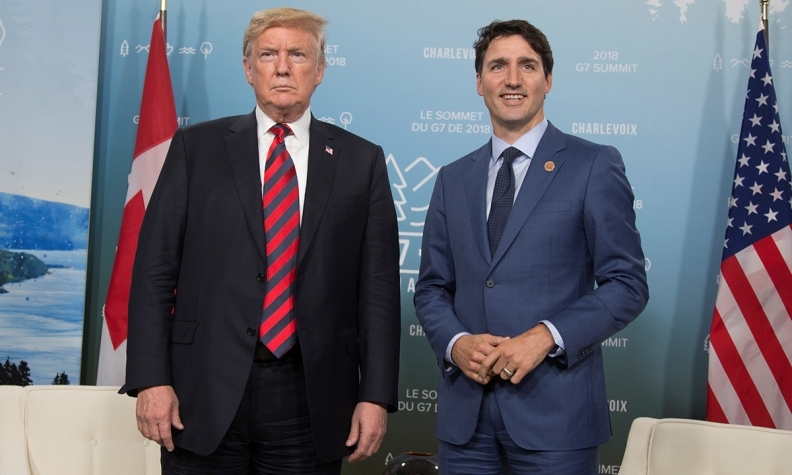 Still, the potential U.S. fallout could make the tariffs a difficult sell to Trump's manufacturing base, said Jerry Dias, national president of Unifor, which represents Canadian autoworkers at GM, Ford and FCA. Canada retaliated when the U.S. imposed duties on imported steel and aluminum last month and would likely do the same on auto tariffs, Dias said. The U.S. exports more vehicles to Canada than anywhere else in the world. "It'll hurt the U.S. as much as it'll hurt Canada," said Dias, who pointed out that the majority of parts in Canadian-built vehicles come from the U.S. "He's going to have to explain to all those auto-parts workers why his strategy makes sense as they're sitting on the unemployment line." The problem with auto tariffs is that it takes a long time to shift production, meaning American consumers would pay the price for several years, said Flavio Volpe, president of the Automotive Parts Manufacturers' Association, which represents Canada's auto suppliers. "If your objective is to have the American companies as well as the Japanese set up on the U.S. side of the border, you're asking private companies to absorb billions of dollars of costs," Volpe said, adding that it would make the North American industry less competitive against rising Chinese players. "At a time when the U.S. is targeting China, it is infinitely dumb."